Infrared image of the core of the Milky Way Galaxy. The Milky Way is our home galaxy. It contains over 200 billion stars, including our Sun. The Milky Way has a diameter of 100,000 light years, and is a barred spiral galaxy. The idea that the Milky Way is made of stars goes back to the Ancient Greek philosopher Democritus. The Milky Way has three main parts: a disk, in which the Solar System resides, a bulge at the core, and an all encompassing halo. This galaxy belongs to the Local Group of three large galaxies and over 50 smaller galaxies. The Milky Way is one of the largest galaxies in the group, second to the Andromeda Galaxy. Milky Way's closest neighbour is Canis Major Dwarf, which is about 25,000 light years away from the Earth. The Andromeda Galaxy moves towards the Milky Way Galaxy, and will meet it in about 3.75 billion years. Andromeda Galaxy moves with a speed of about 1,800 kilometres per minute. The stellar disk of the Milky Way Galaxy is approximately 100,000 light-years (9×1017 km) in diameter, and is considered to be, on average, about 1000 light years thick. It is estimated to contain at least 200 billion stars and possibly up to 400 billion stars. The figure depends on the number of very low-mass, or dwarf stars, which are hard to detect, especially more than 300 light years from our sun. Therefore, present estimates of the total number are uncertain. This can be compared to the one trillion (1012) stars of the neighbouring Andromeda Galaxy. The stellar disc of the Milky Way does not have a sharp edge, a radius beyond which there are no stars. Rather, the number of stars drops smoothly with distance from the centre of the Galaxy. Beyond a radius of about 40,000 light years, the number of stars drops much faster, for reasons that are not understood. Extending beyond the stellar disk is a much thicker disk of gas. Recent observations indicate that the gaseous disk of the Milky Way has a thickness of around 12000 light years–twice the previously accepted value. As a guide to the relative physical scale of the Milky Way, if the Solar System out to the orbit of Pluto were reduced to the size of a US quarter (about an inch or 25 mm in diameter), the Milky Way would have a diameter of 2,000 kilometers. At 220 kilometers per second it takes the Solar System about 240 million years to complete one orbit of the Galaxy (a galactic year). The Galactic halo extends outward, but is limited in size by the orbits of two Milky Way satellites, the Large and the Small Magellanic Clouds, whose closest approach is at about 180,000 light years. At this distance or beyond, the orbits of most halo objects would be disrupted by the Magellanic Clouds, and the objects would likely be ejected from the vicinity of the Milky Way. Observed spiral structure of the Milky Way galaxy. The arrow points the direction of the solar system's motion relative to the spiral arms. The Milky Way's spiral arms. Our Sun is in the Orion–Cygnus Arm. The galactic disc, which bulges outward at the galactic center, has a diameter of 70–100,000 light years. 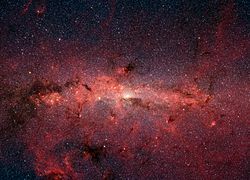 The exact distance from the Sun to the galactic center is debated. 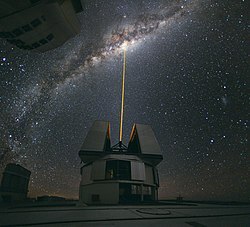 The latest estimates give distances to the Galactic center of 25–28,000 light years. Movement of material around the galactic center shows that it has a compact object of very large mass. The intense radio source named Sagittarius A*, thought to mark the center of the Milky Way, is now confirmed to be a supermassive black hole. Most galaxies are believed to have a supermassive black hole at their center. The nature of the galaxy's bar is also actively debated, with estimates for its half-length and orientation spanning from 3,300–16,000 light years (short or a long bar) and 10–50 degrees. Viewed from the Andromeda Galaxy, it would be the brightest feature of our own galaxy. In Greek mythology, Zeus places his son (the baby Heracles) whose mother was a mortal woman on Hera's breast while she is sleeping so that the baby will drink her divine milk and become immortal. However, Hera wakes up while she is breastfeeding the baby and realizes she is nursing a baby she does not know. According to Greek mythology, she then pushes the baby away and a stream of her milk sprays the night sky, making a faint band of light known as the Milky Way. ↑ 1.0 1.1 1.2 "The Milky Way Galaxy". seds.org. Retrieved 5 August 2010. ↑ "How many stars are in the Milky Way?". universetoday.com. Retrieved 5 August 2010. ↑ 6.0 6.1 6.2 "Milky Way; Discovery of Milky Way; Milky Way Galaxy. SPACE.com". space.com. Retrieved 5 August 2010. ↑ "Our own Galaxy - the Milky Way". University of Cambridge. 1996. Retrieved 2012-11-12. ↑ Christian, Eric; Safi-Harb, Samar. "How large is the Milky Way?". NASA: Ask an Astrophysicist. Retrieved 2007-11-28. ↑ Sanders, Robert (2006). "Milky Way Galaxy is warped and vibrating like a drum". UCBerkeley News. Retrieved 2006-05-24. ↑ Frommert H; Kronberg C. (2005). "The Milky Way Galaxy". SEDS. Retrieved 2007-05-09. ↑ Young, Kelly (2006). "Andromeda galaxy hosts a trillion stars". NewScientist. Retrieved 2006-06-08. ↑ "[0909.3857] The structure of the outer galactic disc as revealed by IPHAS early A stars". Arxiv.org. 2009. Retrieved 2010-08-10. ↑ "Milky Way fatter than first thought". The Sydney Morning Herald. Australian Associated Press. 2008. Retrieved 2008-04-24. ↑ Connors, et al. ; Kawata, Daisuke; Gibson, Brad K. (2007). "N-body simulations of the Magellanic stream". Monthly Notices of the Royal Astronomical Society 371: 108. doi:10.1111/j.1365-2966.2006.10659.x. http://cdsads.u-strasbg.fr/cgi-bin/nph-bib_query?bibcode=2006MNRAS.371..108C&db_key=AST&data_type=HTML&format=&high=45a3b56f2301128. Retrieved 2007-01-26. ↑ Grant J. & Lin B. (2000). "The stars of the Milky Way". Fairfax Public Access Corporation. Retrieved 2007-05-09. ↑ Eisenhauer F. et al 2005. SINFONI in the Galactic Center: young stars and infrared flares in the central light-month. The Astrophysical Journal 628 (1): 246–259. doi:10.1086/430667. Retrieved 2007-08-12. ↑ Staff (2005). "Introduction: Galactic Ring Survey". Boston University. Retrieved 2007-05-10. ↑ Koneãn˘, Lubomír. "Emblematics, agriculture, and mythography in the origin of the Milky Way" (PDF). Academy of Sciences of the Czech Republic. Archived from the original (PDF) on July 20, 2006. Retrieved 2007-01-05. This page was last changed on 5 February 2019, at 15:58.